From North West Texas in Hell or High Water (2016), to Los Angeles in La La Land (2016), many of the 2017 Best Picture Oscar Nominations are rooted in a place. The story’s locations become characters providing texture. Kenneth Lonergan’s Manchester by the Sea (2016) is a prime example. Set in picturesque Manchester-by-the-Sea, Massachusetts, it tells the story of Lee Chandler (Casey Affleck) who returns to his home town following the death of this brother, Joe Chandler (Kyle Chandler), only to discover Joe had arranged in his will that Lee be the legal guardian for his son Patrick (Lucas Hedges). Saddled with his brother’s small fishing boat in need of a new engine that he can’t afford, and the sudden responsibilities of caring for a 16-year-old boy, Lee Chandler must navigate both the grief he is experiencing at the death of his brother and his own complex relationship with the town and people he’d left behind because of tragic events in his own life. 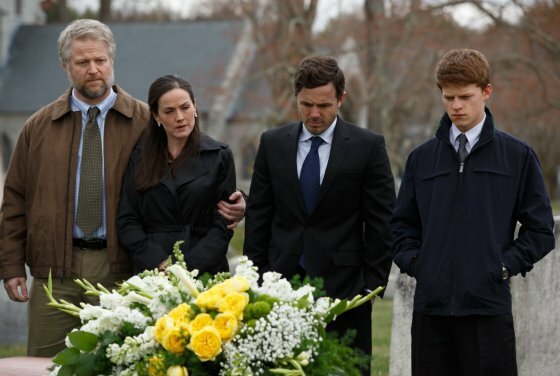 While other 2017 Best Picture Oscar Nominated films like Arrival (2016) and Fences (2016) tackle the topic of grief and loss, few films tackle grief and loss like Manchester by the Sea Kenneth Lonergan’s film provides perhaps the most raw and carefully observed picture of grief. Focusing not just on the external waves of shock, numbness, anger, and sadness that roll over the bereaved, but also the internal challenges that come from closeness to death. For example, Lee Chandler doesn’t believe he is a suitable guardian for his nephew Patrick because he holds himself accountable for the death of other family members due to negligence when an accidental house fire took the life of his children. The long-term effects of that grief led to the breakup of his marriage to his wife and the mother of his children Randi Chandler (Michelle Williams). It also left him emotionally closed and unwilling to pursue any kind of relationship with women that could lead to marriage and children. He refuses offers to date because he knows where that might eventually lead. His grief is poorly masked with a gruff and aloof attitude, and this same grief is the rationale for his personal punishment. Feeling he is not allowed to have more children becomes the dramatic heart of Manchester by the Sea as Lee is pressed into taking care of his brother’s son. Rare is the film that deals with new grief impacted by past, older grief. The prospect of moving from a Boston suburb back to Manchester-by-the-Sea means almost every person Lee Chandler runs into knows his past; every place he goes brings back memories of his family before the fire. This makes Manchester by the Sea more than a film about arranging a funeral and the struggles of taking care of a grieving nephew. The death of his father provides the teenaged Patrick an opportunity to reconnect with his estranged mother Elise (Gretchen Mol) who has remarried. This meeting does not turns out to be what Patrick had hoped for. In the car ride home from their lunch at his mother’s house Patrick says to his uncle and guardian Lee that his mom’s new husband Jeffrey (Matthew Broderick) is very “Christian” to which Lee replies, “You are aware that we are Christians; we’re Christians, we’re Catholics, Catholics are Christians” This is a telling comment. While the film includes a traditional funeral service and graveside burial for Patrick’s father and off-the-cuff comments like the one Lee makes, for the most part faith is not a big part of the family’s grieving process. Although Patrick and Lee want to find some way to get back to a normal life, they don’t agree on what that might look like. In both cases, however, the Christian faith is not a strong part of that normal life they are trying to get back to. Christian viewers of Manchester by the Sea will want to reflect on St. Paul’s words in 1 Thessalonians: “But we do not want you to be uninformed, brothers, about those who are asleep, that you may not grieve as others do who have no hope. For since we believe that Jesus died and rose again, even so, through Jesus, God will bring with Him those who have fallen asleep” (1 Thessalonians 4:13-14). Patrick and Lee don’t grieve with a hope of seeing Joe Chandler again in Christ Jesus. Neither are Patrick and Lee shown availing themselves of the means of grace in the arms of the Church. As Roman Catholics they aren’t shown attending Mass or receiving The Lord’s Supper, or even praying. How do they deal with their grief? Like many lapsed or un-churched people Patrick tries to make peace with the world by embracing a life lived in the world: juggling two girl friends, playing in a band, playing hockey, going to school, planning to repair his dad’s boat. He is the opposite of his Uncle Lee whose instinct is to avoid the world. Yet these two are not shown turning to the object of their faith in their time of need. Manchester by the Sea may be a cathartic experience for filmgoers who continue living with grief, but it will likely be too emotional for people struggling with a recent grief. Christian viewers will want to take comfort in the fact that Christ Jesus numbers Himself among the grieving people of the world; Scripture tells us Jesus wept at the grave of His friend Lazarus (John 11:35). Manchester by the Sea shows that it is better to share grief than to go it alone; however it would be an even better film if it incorporated the stated Christian faith in a positive and active way. 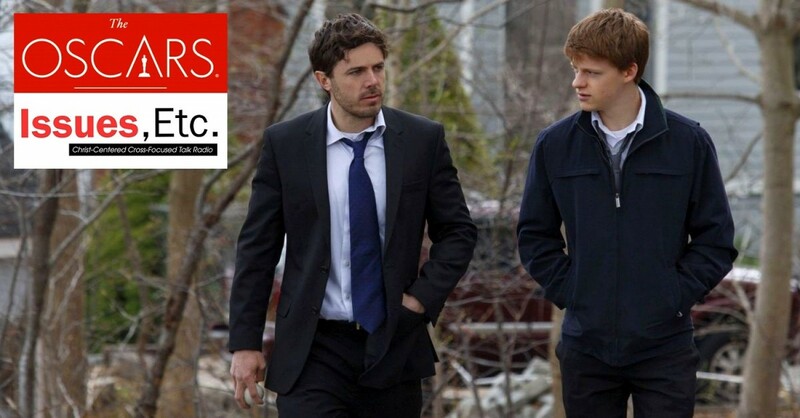 In addition to its nomination in the Best Picture category Manchester by the Sea is also nominated in the Best Director (Kenneth Lonergan), Actor (Casey Affleck), Supporting Actor (Lucas Hedges), Supporting Actress (Michelle Williams), and Original Screenplay (Kenneth Lonergan) categories.